Penguin Random House authors, editors, books and colleagues were in constant demand at this year’s BookExpo (May 30 – June 1) and BookCon (June 2 ­­– 3) at the Javits Convention Center in Manhattan. 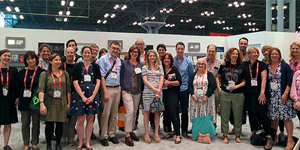 We welcomed innumerable authors, booksellers, and industry visitors to our PRH booth during the BEA trade show on Thursday and Friday, with masses of book-loving consumers coming to see us Saturday and Sunday during BookCon. @BookExpo Markus Dohle, Penguin Random House Worldwide CEO, on Thursday participated in one of this year’s SRO events, “Leadership Roundtable: Publishers on Publishing,” along with Carolyn Reidy, President & CEO, Simon & Schuster, and John Sargent, CEO, Macmillan. Maria. A. Pallante, President & CEO, Association of American Publishers, moderated the discussion. In response to the question, “How is the book business fairing?” Mr. Dohle said, “Better than [its] image, actually, both domestically and globally. 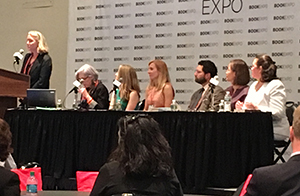 And there are more reasons to be confident about the future of long-form reading and the future of the book.” Penguin Random House editors were featured at each of the always-popular BookExpo “Buzz Panels,” where they generated great enthusiasm for the showcased books. At the Adult Editors Buzz, Becky Saletan, Vice President, Editorial Director, Riverhead Books, spoke of how THERE WILL BE NO MIRACLES HERE by Casey Gerald (Riverhead, 10/2) “breaks the mold for what a memoir should be” as the Yale grad/Harvard MBA author “stands the American dream on its head.” With his rags-to-riches narrative that explores race, class and power, Saletan said, “This book is fire.” At the Middle Grade Editors Buzz, Alex Ulyett, Associate Editor, Viking Children’s Books, praised MONSTROUS DEVICES by Damien Love (Viking Books for Young Readers, 11/13) for its “Raiders of the Lost Ark-type adventure” and “gripping tale” that “makes the big questions – about life, death, truth, and the stories we tell – feel magical.” At the Young Adult Buzz, Dana Chidiac, Associate Editor, Dial Books for Young Readers, DARIUS THE GREAT IS NOT OKAY by Adib Khorram (Dial Books for Young Readers, 8/28) delved inside this book about a half-white, half -Persian boy visiting family in Iran for the first time, talking of how it “demystifies Iran,” while managing a “balancing act of jokes and pathos... and walking a line between friendship and romance.” Adult Book & Author Breakfast co-hosts, actors and husband and wife Nick Offerman (Parks & Recreation) and Megan Mullally (Will & Grace) introduced their upcoming book, THE GREATEST LOVE STORY EVER TOLD (Dutton, 10/ 2) in alternating, revealing sentences about their marriage. Panelist Trevor Noah, The Daily Show host, comedian and author, drew much laughter talking about The Daily Show’s upcoming book , THE DAILY SHOW WITH TREVOR NOAH PRESENTS: The Donald J. Trump Presidential Twitter Library (Spiegel & Grau, 7/31). Children’s Book & Author Breakfast host Jacqueline Woodson, National Book Award-winning Penguin Young Readers author, discussed the timeliness of her two upcoming books, HARBOR ME and THE DAY YOU BEGIN, both being published by Nancy Paulsen Books on the same day, 8/28, and said, “I feel hopeful for young people and looking at life through their eyes.” Oscar-winning actress and children’s book author Viola Davis was a breakfast panelist, and she presented her upcoming book, CORDUROY TAKES A BOW (Viking Books for Young Readers, 9/4), and how she imbued Corduroy’s adventure “with all the magic of the stage” on the occasion of the 50th anniversary of this beloved character. 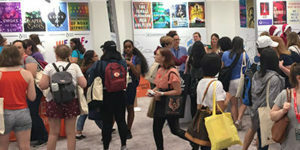 @BookCon Whether attendees were playing corn hole for audiobook prizes, having their faces painted in the Underlined booth, or waiting in line for one of our highly anticipated giveaways, the Penguin Random House booth was a not-to-be-missed destination on the BookCon show floor. Our “What Do Books Mean to You?” Post-It Wall quickly filled, up offering inspiration to anyone walking by, and the in-booth bookstore was constantly buzzing with consumer traffic. Among the in-booth author appearances: attendees made pins alongside Nicola Yoon; lucky winners were able to get their picture taken with PYR authors Sabaa Tahir and Maria Lu; and fans flocked to signings by Kevin Kwan, David Arnold, Naomi Novik, and Rachel Hawkins, among others. There were many Interactive In-Booth Activities: fans celebrated Deborah Harkness’ upcoming novel, TIME’S CONVERT (Viking, 9/18) with a photo op at the All Souls Laboratory; expert book detectives solved the mystery of which book to read next; attendees enjoyed treats and celebrated Underlined’s first birthday; a life-size likeness of Multnomah author Tim Tebow was available all weekend for a fun photo op; fans entered to win all 100 titles featured in PBS’s “The Great American Read” campaign; and the Handmaids even showed up! Readers shared their “reading equation” on Jacqueline Woodson’s “Reading = Hope x Change” Wall; a mystery ARC giveaway from Penguin Teen drew traffic-stopping crowds; the giveaway of Anne Rice’s LESTAT drew costumed fans; Little Women devotees lined up to find out which March sister they are; and life-size likeness of Prince Harry and Megan Markle even made an appearance with Rachel Hawkins, author of the teen romance, ROYALS (Putnam Books for Young Readers, 5/1). Our first-ever “Books & Bubbly: A BookCon Mingle,” a collaboration among PRH Audio Publishing, the Crown Publishing Group, Knopf Doubleday, Random House Children’s Books’ Underlined, and Out of Print, was a resounding success. More than 70 specially-invited book influencers mingled with our colleagues, who touted upcoming titles – many displayed on colorfully decorated tables – while enjoying prosecco, ice cream sundaes, and popcorn, sparking a flurry of influencer posts about the event and our books on Instagram, You Tube, Twitter and Facebook. The hottest ticket on Sunday surely was the one to see Bill Clinton and James Patterson, the two authors of the brand-new thriller, THE PRESIDENT IS MISSING, co-published by Knopf. To view more fun BookCon photos, click here. Throughout Saturday and Sunday, there was great feedback from fans who had attended previous BookCons, who made a point to revisit the Penguin Random House booth. In addition to returning readers, many attendees were attending BookCon for the first time, and we saw a more diverse crowd this year in terms of age, gender, and ethnicity. We hope to see all of our favorite book enthusiasts this summer and fall online or at their favorite bookstore. exhibition booth, there was constant activity and engagement. A non-stop schedule of book signings featured more than 60 authors from our adult and children’s imprints and divisions, including John Grisham, R.J. Palacio, Chelsea Clinton, Sarah Dessen, Nicola Yoon and Mary Pope Osbourne. Our corporate services, sales, marketing and publicity teams kept the long lines moving, while hundreds of signed books flowed into the hands of convention attendees. At the three SRO BookExpo “Buzz Panels,” Penguin Random House editors and publishers spoke eloquently about highly anticipated upcoming titles on their respective lists they are passionate about: At the Adult Editors Buzz Panel, Jennifer Jackson, Senior Editor, Alfred A. Knopf, talked of how the quest for fertility in Ayobami Adebayo’s STAY WITH ME (Knopf, August 2017), “a Handmaid’s Tale set in Nigeria,” becomes all-consuming while “the female spirit stays vibrant, alive, and white hot.” Sarah McGrath, Vice President, Editor in Chief, Riverhead, predicted that Gabriel Tallent’s debut novel, MY ABSOLUTE DARLING (Riverhead, August 2017) “will be held in readers’ hearts for generations and renew your faith in the transformative power of reading,” then quoted from an e-mail she received from Stephen King: “The word ‘masterpiece’ has been cheapened by too many blurbs, but MY ABSOLUTE DARLING absolutely is one.” Sally Kim, Editorial Director, G. P. Putnam’s Sons, admitted that she is a “sucker for adult sibling stories” before revealing that in Chloe Benjamin’s THE IMMORTALISTS (Putnam, January 2018), “a love story of family,” “the Gold children” are told the dates of their deaths by a Lower Eastside fortune teller and how the book “probes the line between destiny and choice, reality and illusion.” At the Young Adult Editors’ Buzz, Ben Schrank, President & Publisher, Razorbill, shared insights into Tochi Onyebuchi’s BEASTS MADE OF NIGHT (Razorbill, October 2017), “packed with dark magic and fantasy adventures that explore the true meaning of justice and guilt.” Phoebe Yeh, Vice President & Publisher, Crown Books for Young Readers, looked at how Nic Stone’s DEAR MARTIN (Crown Books for Young Readers, October 2017) “tackles American race relations” and “how the teachings of Dr. Martin Luther King Jr. hold up in the modern world.” At the Middle Grade Editors’ Buzz 2017, Nancy Siscoe, Senior Executive Editor, Knopf Books for Young Readers, talked about the inspiration behind David Barclay Moore’s THE STARS BENEATH OUR FEET (Knopf Books for Young Readers, September 2017), “a powerful portrait of a boy teetering on the edge—of adolescence, of grief, of violence,” and how he “finds a way forward to build a life with firm foundations and open doors.” The Adult Book & Author Breakfast has hosted by Whitney Cummings, author of I’M FINE…AND OTHER LIES (Putnam, October 2017), who said, “I wanted to write a book that is about removing the shame from being human and making mistakes. It’s okay to say, ‘I’m not doing so well.’” Captain Scott Kelly, author of ENDURANCE: My Year in Space (Knopf, October 2017), a featured speaker, was introduced with a short film, after which Kelly said, “It’s great to be here. Actually after being in space for a year, it’s great to be anywhere with gravity.” He noted the influence of Tom Wolfe’s The Right Stuff: “I decided right then and there that I was going to try to be like these guys from this book…. I was encouraged and I was motivated by something I read, and it was life-changing for me.” Several Penguin Random House authors’ BookCon events drew large crowds, notably: Margaret Atwood, author of THE HANDMAID’S TALE (Anchor) and Bruce Miller, the series’ showrunner for Hulu (which adapted The Handmaid’s Tale for television), who discussed the adaptation of the book for the small screen series, already renewed for a second season. Watch a video of the discussion produced by our Penguin Random House Digital Video team below. The “Bestseller to Blockbuster: Authors Talk About the Book to Film Adaptation Process” panel featured R. J. Palacio, author of WONDER (Knopf Books for Young Readers) and Nicola Yoon, author of EVERYTHING, EVERYTHING (Delacorte Press), sharing details about their involvement in the process for adapting their books into film productions. And Sarah Dessen, author of ONCE AND FOR ALL (Listening Library, June 2017), Nicola Yoon, author THE SUN IS ALSO A STAR (Listening Library) and Holly Black, author with Cassandra Clare, of THE SILVER MASK (Listening Library, August 2017) were the stars of the “I’ll Take Audiobooks for $400, Please,” an Audience vs. Author Game Show, involving a packed room with the fun proceedings. Check back and view more of Penguin Random House Digital Video’s BookCon productions here.